We're into our final week of this opening month of side control. Dónal decided on an unusual technique for tonight's class, though it fits with the series he's been having us drill for a few weeks now. Again, this applies when they are turning away from you under side control, but instead of taking the back like last time, Dónal moved into a choke instead. Before, when they turned away, you slipped your arm underneath theirs, bringing the other arm over their shoulder to lock up a harness/seat belt grip. From there you could move into a back take, working off Marcelo Garcia's principle that the harness is the most important aspect of controlling the back. This time, Dónal snaked the arm around the neck after having brought it underneath their armpit. This was not to secure the back, but to set yourself up for a choke. Reach as far as you can with that arm, then turn your body so your shoulders and upper back are pressing into their upper back. That should hold them in place. You're also up on your toes, to maximise the weight. To finish, you have options with and without the gi. If you have a gi, you can go for an ezequiel. With the hand of the arm you've got around their neck, reach for your other sleeve. With the sleeve hand, chop into their neck, using the fabric of your gi to cut off one artery, then your arm around their neck combined with your chopping hand to cut off the other. 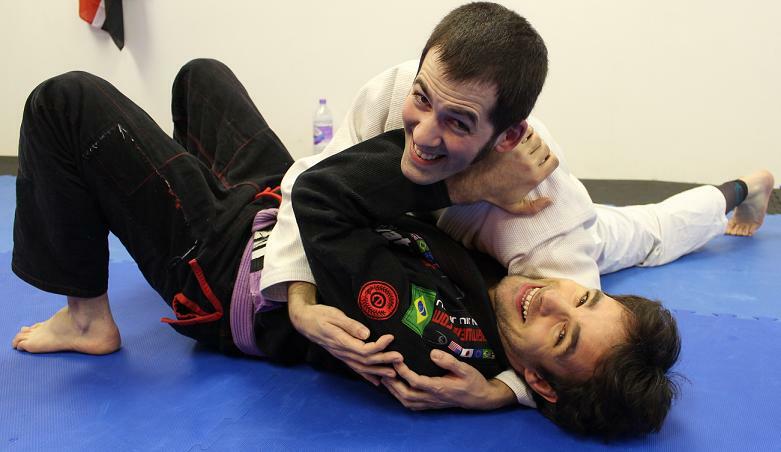 The nogi variation is to grab the crook of your other elbow rather than your sleeve, then finish effectively as you would with a rear naked choke (except you've still got their arm inside). If they keep on turning away from you and you can't secure that grip, then you can take the back. Either bring your knee underneath them on the near side and roll them over, or more acrobatically, bring a knee over the far side and throw yourself over their body. You can then again roll to take the back. Ah. Will have to try this. If I fail I'll ask you to demonstate it when we meet. I love the ezekiel choke.